Our product begins a vision of the future where you only need one, wearable device. Due to space and time constraints, the chosen device became a belt with a Raspberry Pi in it. The lofty end goal hopes that the device would be able to assist in all aspects of life: from shopping, controlling your home, to assisting with bank purchases. In the future a platform like a watch for men or a necklace for women would be more ideal. We scaled the project down to only control shopping at this point. At this hackathon we created a server, a mobile application, a web application, and an interface for the Raspberry Pi. 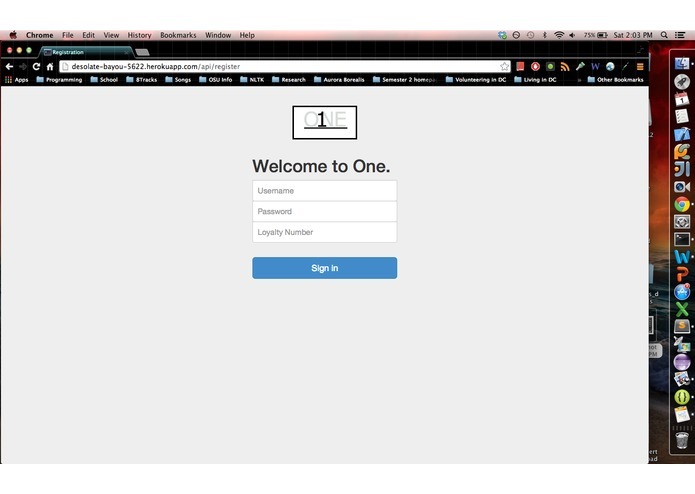 The user registers an account using the web app and logging in with their phone. The project starts when the user walks into a shop and a signal is sent to the Pi. The Pi contacts the server, which notifies the user's phone and tells them that they entered the store and other information (preferences, past purchases etc). Then when the user leaves, a signal is sent to the Pi again. The Pi contacts the server and another notification is sent to the user's phone telling them how much they spent at the store, what they bought, and what they might like to buy next time. This project is very much a proof of concept to determine whether this idea is a technologically viable one.